If there is any consolation in losing a war that the Austro-Hungarian Empire started, it is that a resounding defeat wiped out the Empire, thus absolving all those involved in the military folly of the burden of explaining the great loss. In contrast, Germany continued to exist, even if not as an Empire, after The Great War, and was burdened with the responsibility of answering to the people. Even before the War was over, the subterranean on dit was that the “Jews” were responsible for the lack of a decisive victory, and, once the war ended, this age-old anti-Semitic tactic remerged loudly and clearly. The military, clearly to blame for the failure of their battle plan, cravenly hid behind the “stab in the back” theory of betrayal at home. After the War, the Jews became suspect, despite the fact that they too had fought for their country and the military marched home with honor. The Austrians marched home, no longer alongside the Hungarians and the ethnicities gathered together under the umbrella of an uneasy autocracy. The Republic of Austria, the German-speaking region of the erstwhile Empire, was created by the Treaty of Saint-Germain-en-Laye of September 10, 1919. The Austrians beckoned to the Hungarians, attempting to rejoin as one nation, but the Hungarians, another ethnicity altogether, preferred to be independent. Even so Hungary, under the Treaty of Trianon, turned lands, including Transylvania, to the new country of Czechoslovakia, which was formed out of parts of Austria, as well. Other territories belonging to the Empire broke off into largely ethnic pieces, including Poland and the new nation of Yugoslavia. Left standing alone, Austria was forbidden by the same treaty to join with Germany in some kind of twentieth-century pan-German swarth across Europe. Further stripping of territory occurred when the South Tyrol, Trieste, Trentino, and Istria were ceded to Italy–something of a reward for the long and bitter White War, which had brought Italy to its knees. And so the Empire of one of Europe’s most famous and powerful families, the Hapsburg, ends on a whimper, drowned out by the defeat of its more powerful neighbor, Germany. As Manfried Rauchensteiner wrote at the end of his book, The First World War and the End of the Habsburg Monarchy, 1914-1918, “By now, a great deal has been written about the First World War and then final years of Austria-Hungary, However, it is far exceeded by the material concerning events in Germany, Belgium, and France. Even so, it is possibly a banal observation that we should be mindful of the fact that without Austria-Hungary, the First World War is neither conceivable, nor can it be explained satisfactorily..In the case of Austria-Hungary, it is by no means only the military events that should be taken into account, but also the overall political framework and the many-sidedness that caused this unstable, fragile structure that the Habsburg Monarchy had already been before the war to crumble. It was not a sudden end, but a process of dissolution, which was merely accelerated by the war, and which probably led to the most far reaching changes in Europe in the modern age.” With the fall of the Hapsburg Empire came the rise of a modern Italy, under one of the first modern dictators, Benito Mussolini (). Austria, the prime enemy and the main loser of territory and power was forced to turn over its cherished territory of the Tyrol to its belligerent neighbor. 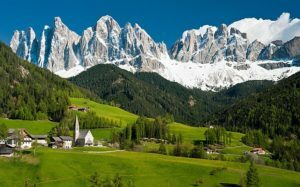 The south Tyrol is particularly famous, one hundred years later, for remaining stubbornly German speaking and retaining its Austrian heritage after it became part of Italy in 1919. Mussolini attempted to eradicate the Austrian traditions and outlawed the German language, but after a century of a forced union of Austria and Italy, the lesson might be that you can take a territory, legally occupy land but you cannot change a culture. Indeed President Woodrow Wilson insisted on ethnic groups being kept together, but to the Allies, the least they could do is to award the South Tyrol to Italy. 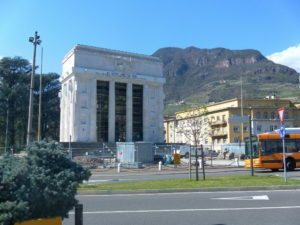 In 2014, an interesting article in The Guardian during which a journalist, Silvia Marchetti, visiting the capital city of the region, Bolzano (Bozen), remarked, “People here speak in German and have a hard time replying in Italian. When they do, their strong Teutonic accent takes you aback. They’re Italian citizens but simply don’t feel Italian. Bolzano’s local authorities estimate that German is spoken by 75% of the 510,000 inhabitants of the Alto Adige region. Locals, however, call it by its original name – South Tyrol – and many wish it were independent.” Mussolini still presides in the town square and the Italians still work hard to repress the German-speaking citizens. The victory monument by the very famous Italian architect, Marcello Piancentini, is typical of the way in which Italy imposed itself upon a very different culture through architecture. The native architecture of the area is medieval, churches which spires straining to compete with the Dolomites in the background, but the Victory Monument–its name is an insult to the Austrians who lost to the Italians–is an example of Italian fascism’s penchant for blending classicism with modern forms. As if the construction imbibed the pettiness of the attempted repression, the quasi-arch is not Piancentini’s work. Clumsy with strangely thick corners and an oddly thin pair of columns, the Monument, built in 1928, is an early incursion into Austria’s former territories by a fascist government eager to mark its conquest and acquisition. The inscription above the tall columns reads, “Here at the border of the fatherland set down the banner. From this point on we educated the others with language, law, and culture.” Today Victory Square is extremely unprepossessing as though rendered bereft by the message of the victor’s determination to wipe out an entire heritage. It would be here, in terre irredente, now reclaimed, that the Italians erected one of the most impressive ossuaries, Monte Grappa (1932-1935), by the same team of architects who designed the Redipuglia. As Hannah Moore explained, “The location, or positioning, of the ossuaries in the landscape was also an important source of meaning. Many were located in areas that were previously under the Austro-Hungarian Empire, and which were appropriated by Italy as a result of the First World War. Thus, they marked newly-won territories and acted as symbolic “sentinels” placed near Italy’s new borders. They staked a claim on new lands and helped to justify the lives lost in the acquisition of that land. They were also part of efforts to ‘italianize,’ or assimilate, the local population, which involved the repression of Slavic languages and local cultures.” Rising 5826 feet and overlooking the battlefields below, the Sacrario di Monte Grappa is yet another example of the simple geometry employed by Giovanni Greppi and Giannino Castiglioni. 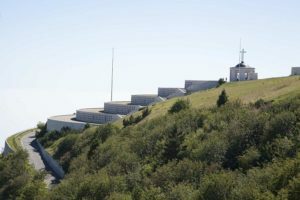 The memorial is a simple rising series of semicircles, ascending like circular terraces, beckoning the pilgrim towards the blue sky at the top of the green hill. There are sacred grounds, sites where tens of thousands of soldiers, Italian and Austrian, gave their lives for their nations. Today this Heroic Route, or Via Eroica, leading to Monte Grappa, is, like the other ossuaries, located in tourist country. Hikers can still stumble across abandoned debris and litter that is still scattered across the meadowlands. In fact, beneath the Sacrario is a series of tunnels, used by the soldiers during the Great War. When the plans for this structure began to be formed in the mid-twenties, it was hoped that the dead could be reverently placed in these military burrowings but the ground proved to be too wet. The resolution of the placement of the 12,615 bodies of Italian soldiers was to create a series of six concentric circles, each smaller than the last as they ascend, behind which the sacred dead rest in peace. Set off to the side at some distance away is a place for 10,295 Austro-Hungarian soldiers, who, like their Italian counterparts are mostly unidentified. As designers, Greppi and Castiglioni seem to have had a simple forumla: geometric repetition. At the Redipuglia, the motif was straight-lined horizontal terraces, riding gradually towards a horizon line. The risers of the flight of steps became a field of writing, a kind of verbal text: the word “presente,” which acts as another silent rhythm to offset the elevating terraces. The Antiqua font acted to remind the Austrians that this land once belonged to and was settled by the Romans. The original owners had reappeared. Monte Grappa used not only low walls of concentric circles but punctuated these walls with dark half circles, lined up along the front of the walls. Like the Redipuglia, the journey of the marcher ends in a chapel, topped by a cross. The presence of the cross automatically transforms a graveyard into sacred territory. 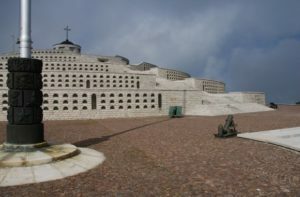 Although the Sacrario di Monte Grappa is small in the number of bodies it shelters, the complex and its site and the challenge it gives to the visitor is impressive. Giovanni Greppi and Giannino Castiglioni designed the most imaginative and the most moving memorials to a horrible series of battles. 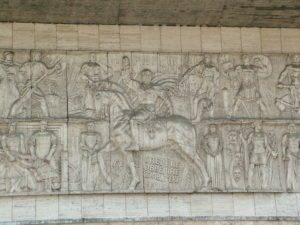 Unfortunately, the motives of the Fascist government of Mussolini were not as elevated as either the sites marked by the designers nor were these political ends worthy of the talents of Greppi and Castiglioni. The task, as it were, of such a structure was a mixed one, at least from the perspective of the Fascist government. On one hand, Monte Grappa is a straightforward memorial, mourning the unknown dead, the unclaimed young men, who had nowhere else to lie. But on the other hand, this building is also a monument, celebrating a victory. This victory is not just military; it is also a triumphalist expression of ownership, celebrating the return of the long-lost terre irredente, now found and reclaimed. And then, there is, of course, the future. The intensely political public mourning and reclamation of long-lost lands turned the many ossuaries along these alpine regions into warnings that, if a new Roman Empire, Fascist style, were to be build, more sacrifices would be demanded.